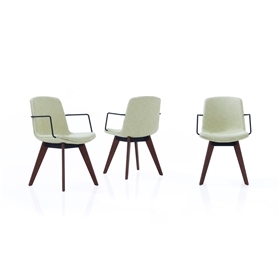 Cubb is a concise range of contemporary chairs, stools and tables. The seat is constructed from a specifically contoured FSC Beech plywood veneered shell with an additional liner, which is covered with CMHR foam seat and a Vitafoam V21 outer surface. The organic shape of the seat provides a generous and ergonomic sit, which is refined with an integrated lumbar support and a gentle from edge waterfall. The seat shell is a two part inner and outer construction, which allows the chair to be upholstered in as wide a range of fabrics as possible. The refined metal arms extend from the split between the seat inner and outer shells parts and are available either painted or chromed. The wooden base combines FSC solid oak legs with structural steel metalwork, creating a robust high performance construction. The natural aesthetic of the wood creates an inviting design, which is highly valued within more relaxed, and informal settings. The solid Oak legs are available in a choice of finishes including natural European white oak or stained light, walnut and black. The structural metal chassis adds a layer of playfulness and offers the specifier the opportunity to personalise the design with a choice of six carefully selected RAL colours. The visible fixings are designed to celebrate the honest construction - utilising the materials to their full potential.